Wayne Newton is one of those Vegas entertainers that us locals tend to take for granted. He's here, always has been and probably always will be, or so it seems. 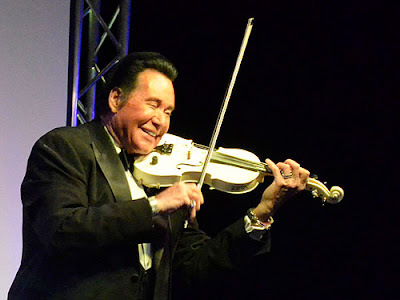 Whenever I'd asked anyone if they'd seen Wayne Newton or Mr. Las Vegas (as he is known), perform, I always got the same answer from anyone who had, "Oh yes and he was wonderful, just so talented and charming!" Nobody had a bad word to say about his act. I never forgot this because unfortunately I' d never gotten around to seeing him perform, even though he's been doing so his whole life. So when he recently opened a new show at Bally's I made sure I was there. Wayne Newton - Up Close and Personal takes place at the newly renovated Windows Showroom. This is the perfect venue for him. He's not trying to fill a huge theater anymore. Now is the time in his career to reflect and share with his audience in a personal way. This new show is a chance for him to sing a little, play a little, tell some stories and answer some questions. I like how he enters from the back of the room greeting everyone along the way, and has just a three piece band along with some multimedia and a special friend to support his story telling. The whole setup makes you feel like a special guest in his home. Wayne starts out with the story of his life and how he saw Hank Williams perform at the Grand Ole Opry at age four and knew that that's exactly what he wanted to do. So he got started right away, singing at age five with his brother. Eleven years later they found themselves performing in Las Vegas as teens. This started his 60 years of performing in Nevada. He talks about being first produced by Bobby Darin, appearing on the Jackie Gleason Show, touring with Jack Benny and of course performing with Frank Sinatra, Sammy Davis Jr. and Dean Martin as a special guest. He shares his experiences starring in Bonanza, North and South and one of his best known roles (as himself) in Vegas Vacation. Oh, and to hear Wayne Newton sing Danke Schoen live is something nobody should miss! His stories are not only interesting but provide insight into the world of a lifelong entertainer, and the many ups and downs this unique lifestyle can have along the way both personally and professionally. He has made some mistakes and some wrongs have also been done against him, but he's still out there showing us all how to thrive by focusing on doing what one does best. To see Wayne Newton do his show is to see someone at his most alive. If anyone was born to entertain he was, and it just pours out of him. The love and energy he brings to a room is magical. I have seen many shows and am a bit spoiled that way, but Wayne Newton truly enchanted me.